You don&apos;t have to travel "back east" or "down south" to get the chance to see a Civil War battlefield. One of the largest Cavalry Battles of the war took place right in our own back yard. 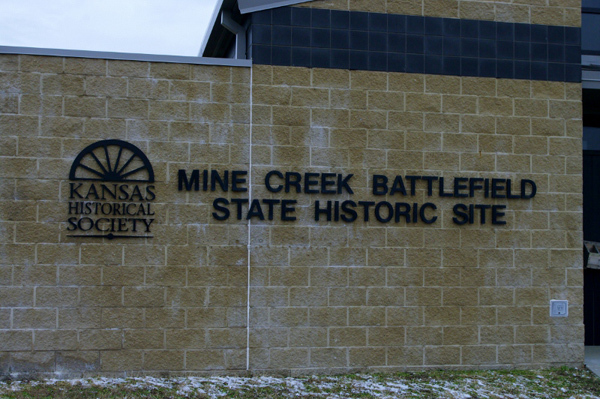 While our state is famous for "bleeding" during the many skirmishes of those tumultuous years, the Battle of Mine Creek was a major Civil War battle fought on Kansas soil. The site of the fight sits outside Pleasanton off U.S. Highway 69 at K-52. It is very easy to find; has a State Historic Site visitor&apos;s center open April thru October; and includes outside walking trails open year round for self-guided tours. The Battle of Mine Creek is a classic American underdog tale. It only took 2,500 Union soldiers to defeat the 7,000 Confederates of General Sterling Price&apos;s Army who tried to stand ground there on October 25, 1864. The Confederates had retreated this far after a defeat at the Battle of Westport (in current day Kansas City, MO). It was not a clear stand, the field was muddy and the Union forces DID actually freeze in their tracks after coming over a hill to face an army three times their size. However, better fire power and Mine Creek itself, which was swollen with high waters and muddy banks, aided in creating a Union victory that day, ending any Confederate threat in Kansas. It was a brisk day when we visited the site, but my son and I took a walk on one of the trails that included signage outlining the points of the battle, and were able to visualize the fight aided by large red markers on the open field. It was a nice area for a hike, and the opportunity to touch the history of the place makes it a great spot to visit. While there is a small area that is paved and accessible, to take the larger hikes of 1 to 3 miles, be prepared to walk over rough ground. If you can and do choose to take the hike, you will also learn a little bit about the natural flora and fauna of the area. The visitor&apos;s center is opening again this week after a winter break. It is only open from Wednesday through Saturday 10 a.m. to 5 p.m. Cost to see the inside exhibits which explore the context of the battle is $5 for adults and $1 for students. Children five and under are admitted free. The trails are also free.